Only in Dr. No and Live and Let Die so far do we get to see where James Bond lives, but in Live and Let Die we also get a glimpse inside his coat closet. We can see five coats in his closet. From left to right there is a shepherd’s check coat, a light grey suede trench coat, a navy double-breasted chesterfield with a velvet collar that Bond wears to New York in the following scene, a beige cotton trench coat and a charcoal or dark brown coat. 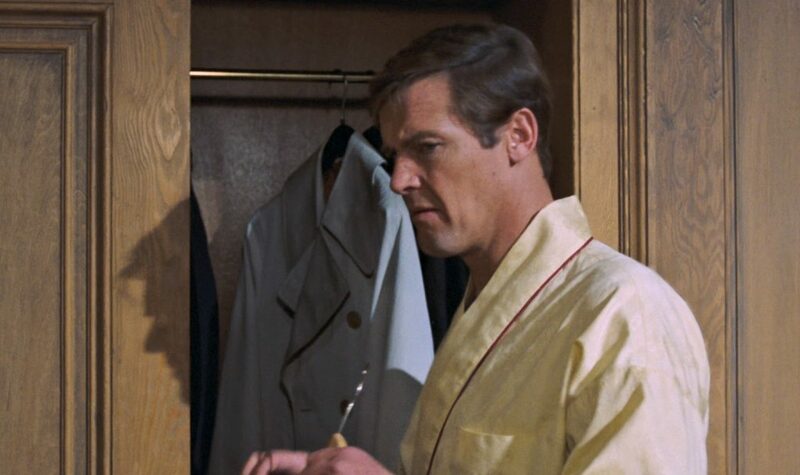 Bond enters his coat closet wearing a yellow dressing gown made by Washington Tremlett. Only a sliver of the sleeve of the checked coat is seen. It is a black and grey shepherd’s check tweed, which might have some other colours subtly woven in. The coat likely has raglan sleeves. Bond would possibly wear such a coat over his tweeds in winter. The second coat is a grey suede trench coat, likely single-breasted. It has set-in sleeves (differentiating it from the raglan-sleeved balmacaan), a large, pointy collar, thick belt loops and dark brown buttons. 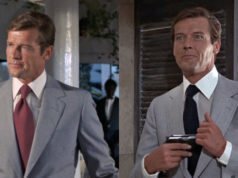 Though Roger Moore doesn’t wear any trench coats in his Bond films, he wears them in many television shows and films including The Saint, The Persuaders, That Lucky Touch, The Wild Geese and The Muppet Show. In the 1987 James Bond retrospective Happy Anniversary 007, Moore wears both a traditional tan gabardine trench coat and a light brown corduroy trench coat. 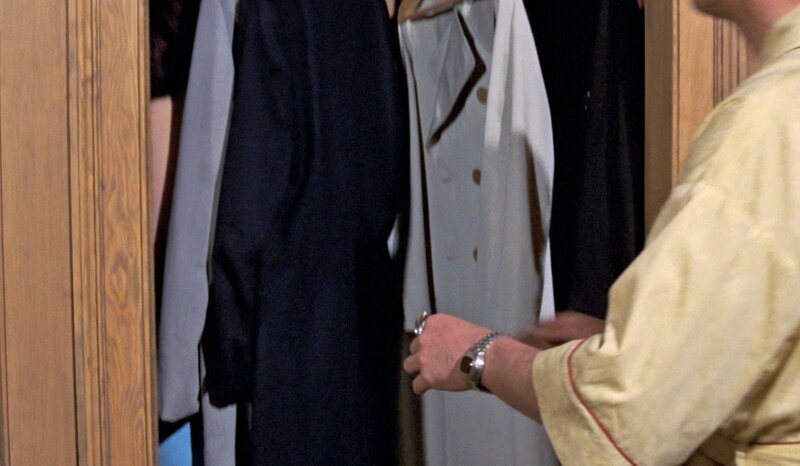 The fourth coat is another trench coat, but this one is a more classic double-breasted cotton gabardine trench coat. Traditionally they come in a darker tan colour, and this one is a lighter beige. It has an eight-button double-breasted front and set-in sleeves but lacks the shoulder straps of the classic trench coat. The belt is not visible, but it doesn’t mean there is no belt. It is similar to the more traditional trench coat that Bond carries into the office in For Your Eyes Only. Neither of the trench coats in Bond’s closet are traditional versions of the trench coat and take cues from the fashions of the day. The last coat in the closet is hardly seen, and the closet is so dark in the corner that it is difficult to tell what style it is and whether it is black, charcoal or dark brown. Besides the clothes in the closet, the hangers are also important to note. Bond’s hangers are somewhat thick and slightly contoured to give proper support to the jacket’s shoulders. The more the hangers resembles human shoulders the better support they provide. Structured overcoats and top coats—as well as suits—need the support of hangers that resemble human shoulders to maintain their shape. Thin, straight hangers are fine for unstructured garments like trench coats, but can cause dimples and collapsed shoulders on structured coats. How much suits have Bond? 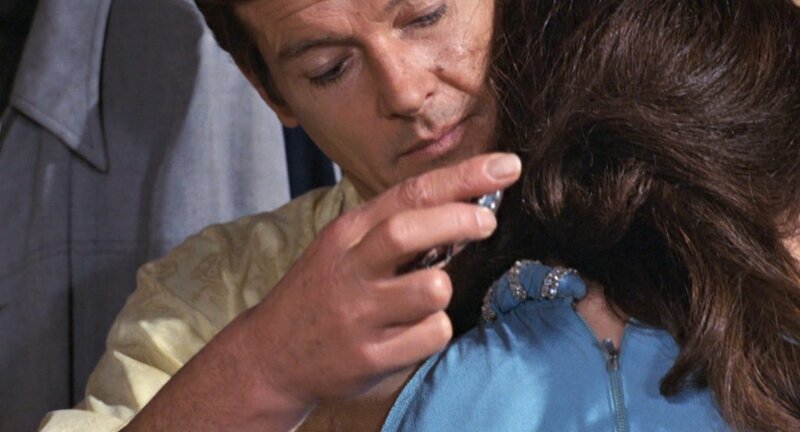 Probably many are destroyed during the missions,and is probable that Bond get rid of some because are out of fashion (too small lapels)..as had to do the fashion victim Roger Moore (what waste of good bespoke!). So we said that 007 have not more of five,six suits at time (more some sport coats and dinner jackets and overcoats)? A dozen of pieces in all that renews every two-three years,or for his need? This is actually a great question. 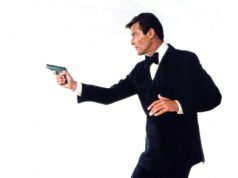 How many suits would the literary or the film Bond realistically have in an active rotation at one time and then in the sixties versus today. Yes, I raised a similar question on this site some time ago. As much as we all love discussing Bond’s wardrobe (that’s why we’re here), and accepting the suspension of disbelief necessary to view a Bond film, the recent theme of less fantasy and more realism is a bit incongruous with his clothing for me. Bond is supposed to be a reasonably well paid civil servant with a need for versatile clothes that allow him to blend in to whichever situation he’s faced with, and at the same time permit him a certain latitude for action. Mendes / Ford has him in a completely new set of several very expensive suits and casual clothes every few years, many of them ill-suited to the job. Literary Bond is always conscious of the possibility of the bulge under his arm made by the Walther. Film Bond manages to produce his canon from a Peewee Herman suit! The pea coat outfit from SF and the casual clothes in QOS may be less elegant but are more fit for purpose, and as much as we like seeing Bond in his obligatory dinner suit, I wonder if the time will come when the screenwriters are unable to find a fitting scenario for him to suit up. I haven’t worn mine in two years. Fleming describes Bond’s togs in some detail, but like his own clothing they were unremarkable, utilitarian, unfussy and demure, and he treated them without sentiment (hanging his jacket in the window to dispel the smell of cordite from the firing range). You could imagine this Bond, like Fleming, wearing suits for many years until the cuffs frayed. Was it ‘Goldfinger’ which describes Bond wearing one navy suit, packing its partner, along with a ‘yellowing dogtooth suit and Saxone golf shoes’. I don’t think he would be seen runway-side in Milan or getting fitted up for the latest Tom Ford creation. My complaint with Bond’s clothes in Skyfall and SPECTRE is that they don’t fit. I also don’t think Bond should be a flashy dresser. But I would never complaint that his clothing is too nice. Bond is an aspirational character and I don’t want to see him wearing the same yellowing dogtooth suit for three straight films. The notion that Bond would dress in that manner was done away with the moment Sean Connery first graced the screen and was completely annihilated during Moore’s turn as Bond (just look at the image above). To assert that somehow Craig/Mendes/Ford are responsible is laughable. It is interesting that his LALD chesterfield is actually hanging up in the closet, before he sets out to New York. The magic of film making usually precludes any sensible analysis of Bond’s wardrobe and where he gets his clothes from. Take QOS for example. Bond arrives at a black tie event, somewhat bloodied and disheveled. He finds a perfectly fitting Tom Ford dinner suit. His credit cards are cancelled so he travels to Italy to see Mathis. Acquiring another perfectly fitting Tom Ford suit, he flies to bolivia. He is only carrying a small suitcase and no suit carrier. However, he still manages to produce a another perfectly fitting Suit, which gets ruined. He gets chased out of his hotel room and is obviously separated form his clothes. However, he still manages to visit the Tom Ford and Church’s shop in Bolivia for his final outfit. Matt, did I have a vivid hallucination at the weekend or did you have a piece up on the Spectre clothing? There was a problem and it had to come down. Sorry about that. The information in it will all be written about again in future articles, and the suits in it have already been featured here anyway. I’ll second that. Another gentleman lost to the world. Both McNee and his Steed character (an extension of his quirky, unorthodox self) were wonderful and the man seemed to ooze charm, humour and grace effortlessly. I’ve no doubt that Matt will honour him here suitably! I enthusiastically second David’s request, Matt. Patrick Macnee’s suit in the Diana Rigg color episode “The Joker” might be of interest. The beige one with the blue and brown stripes? Actually, I was thinking of the grey suit with navy (I think) pinstripes that he is wearing at the beginning of the episode. I think this has been touched in elsewhere (by myself and others), but I do miss Bond being well-dressed and his clothes looking like they have been worn a few times. While incredibly sumptuous looking, the suits from 1995 on have almost always looked never-worn-before. Connery gave the impression of having the same suits that he wore over and over (at least an accurate imoression for the hacking jacket) and Moore’s suits, while impeccably tailored, looked used and occasionally alike enough to prior films to be assumed to be the same (even though we on this blog know otherwise). Anyway, interesting look into Bond’s closet. About what we would expect. We don’t get a good view of it but there is a closet full of suits in Scaramanga’s junk.